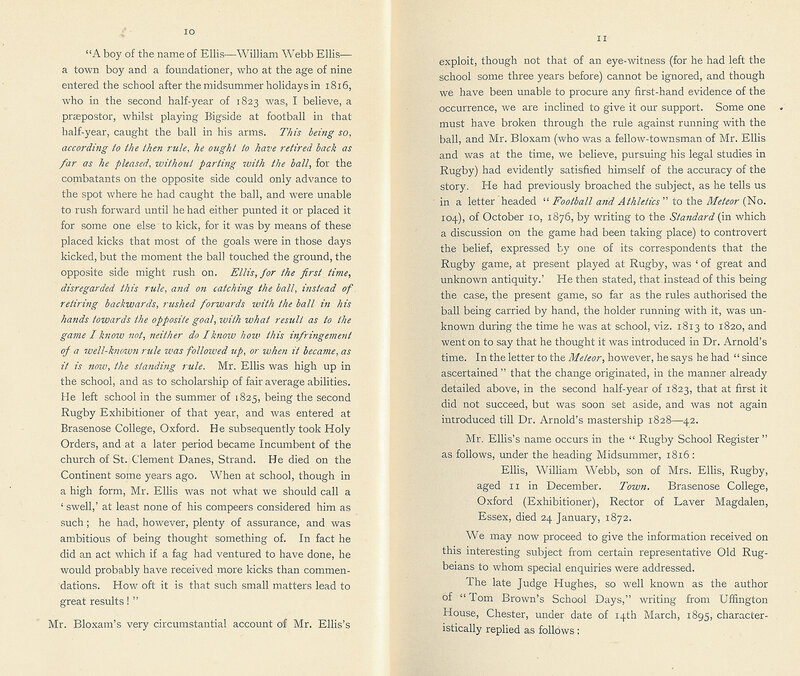 WILLIAM WEBB ELLIS EVENT 1823 - IS IT THE ORIGIN OF RUGBY? Is it really the Origin of Rugby Union? It is impossible that William Webb Ellis invented Rugby Union. The theory that he did is contained in a publication dated 1897, called ‘The Origin of Rugby Football’. 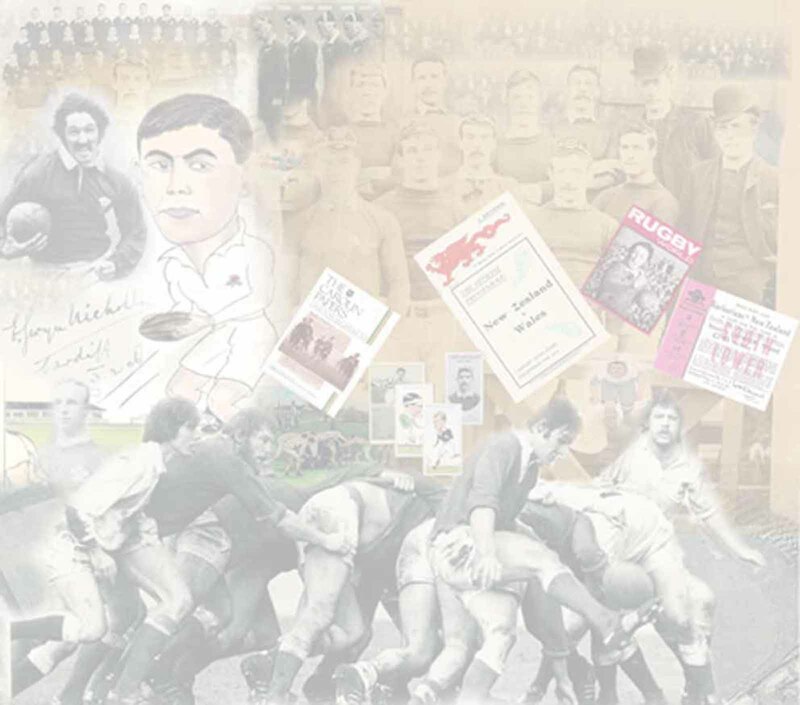 At the time the William Webb Ellis Event was accepted as the origin, however it is now generally accepted by historians that this event is not the origin of the sport of Rugby Union. 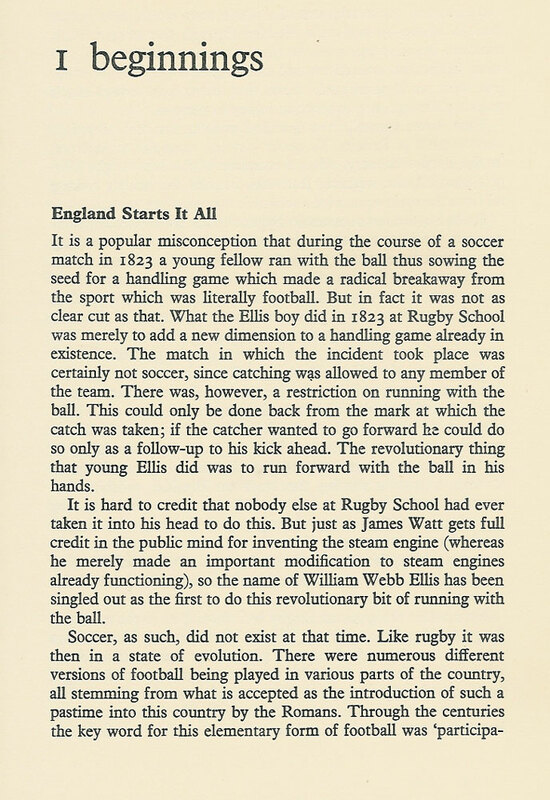 The author of the publication ‘The Origin of Rugby Football’ states that Matthew Bloxam, who was dead and unable to challenge the findings wrote that Webb Ellis invented Rugby Football. However, in the writings of Bloxam, he only stated that Webb Ellis started the change in one of the rules, he was unsure in which year Ellis did this (1823, 1824 or 1825) and this he learned from a unnamed third party between February and October of 1876. Bloxam was told about the William Webb Ellis event 53 years after it is supposed to have happened and 4 years after William Webb Ellis died. Bloxam's view was that Webb Ellis was playing the same game that he was playing while he was a pupil at the school 1813-1920. 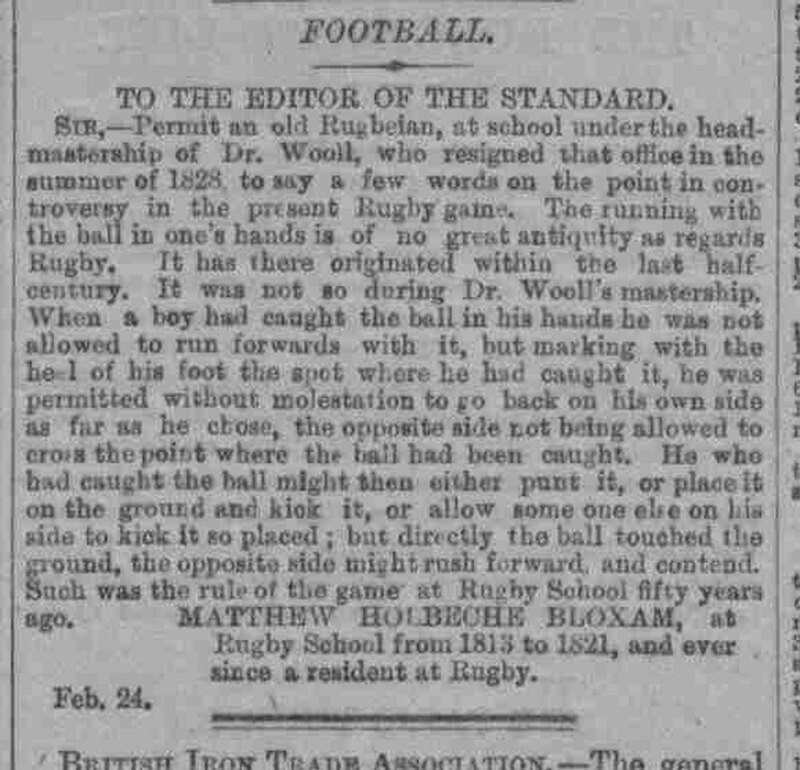 This being the case in 1823 Webb Ellis was already playing Rugby Football, a game where you could only win a match by kicking the ball between the posts and over the crossbar, Bloxam was not of the opinion that Webb Ellis invented a game, his opinion was that Webb Ellis only started a change in one of the rules of Rugby Football, the same game he played in 1813. The common modern misconception is that Webb Ellis was playing Association Football. This is impossible because the game of Association Football was not invented until 1863. The report ‘The Origin of Rugby Football’ is written by a group of Old Rugbeians (former Rugby School pupils) whose sole intention is to place the 'origin' of Rugby Football at Rugby School, they didn't care how they did it and they used methods of deception to credit Webb Ellis with the invention of Rugby Football. The theory that the William Webb Ellis event was the origin of Rugby Union didn’t begin in 1823, but instead began 74 years later in 1897 with the publication of a report by a sub-committee of the Old Rugbeian Society called ‘The Origin of Rugby Football’. The conclusion of that report is that the origin of Rugby Football began with William Webb Ellis in 1823. 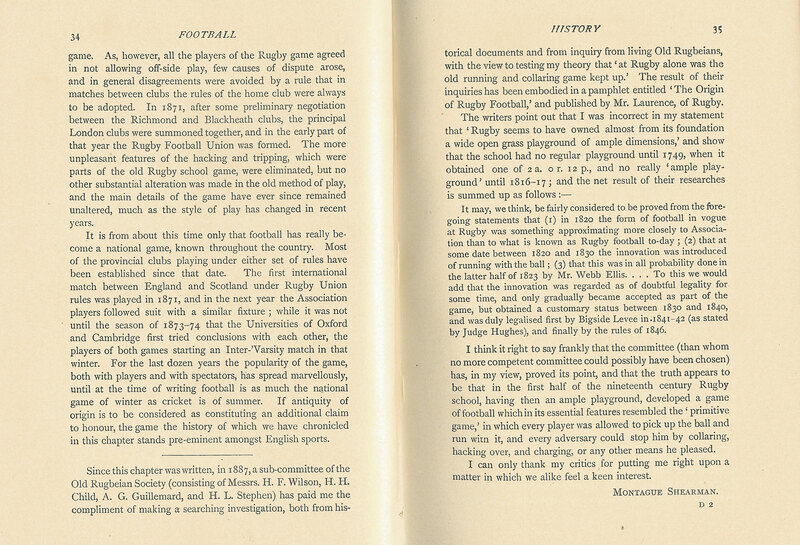 From the opening paragraph we can surmise that the reason that the report was commissioned was to dispute Montague Shearman’s claim that the ‘original’ version of folk football survived at Rugby School because it had a large playground (wide open spaces) and because Rugby Union at the time of his book had similarities with folk football, in that you were allowed to carry the ball. The Old Rugbeian Society found Montague Shearman’s conclusions to be “misleading, if not altogether erroneous”. WHAT WAS THE PURPOSE OF THE REPORT? 1 – That Rugby School did not originally have wide open spaces where a game of folk football could have survived. 2 – That Football at Rugby School was mainly a kicking game, which then developed into a handling game. DID THE REPORT PROVE THAT THERE WERE NO OPEN SPACES FOR FOLK FOOTBALL TO SURVIVE? The report is selectively quoting Shearman here, although at least getting the title of his 1885 work correct. 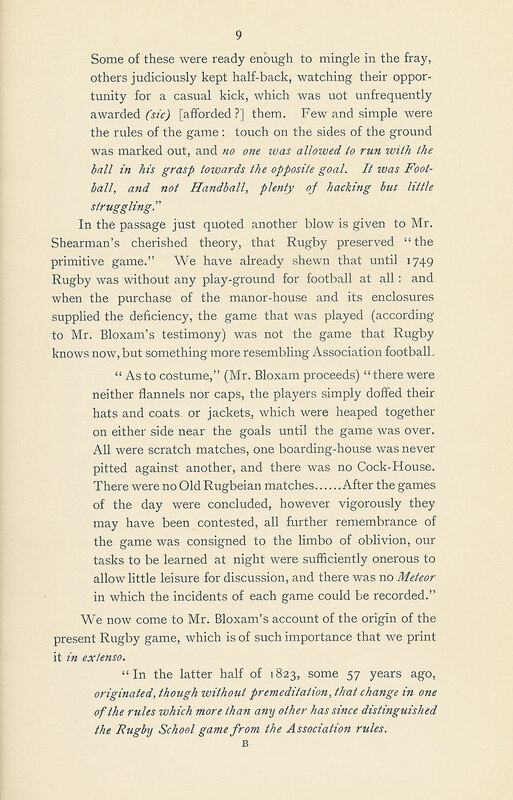 In ‘Foot-ball – Its History for Five Centuries’, Shearman did state that Rugby School was the exception to this rule, and in 1887 he is just confirming his earlier diagnosis. 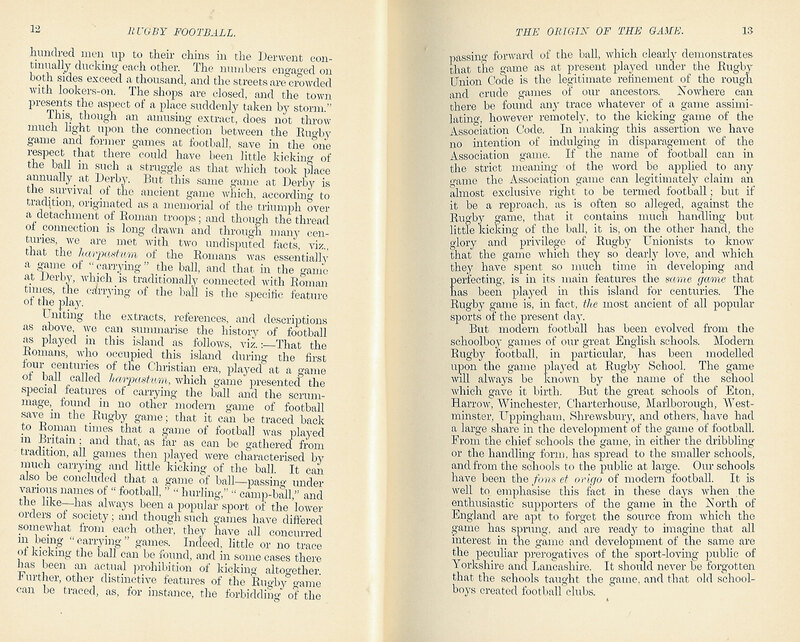 The big picture, however, is that in that book Shearman makes Rugby School the public scapegoat, so that his folk football origin theory can be traced back to ancient times and the ‘original game’, because as we will show in a future article, it’s almost impossible to link folk football to being the origin of Rugby Football. 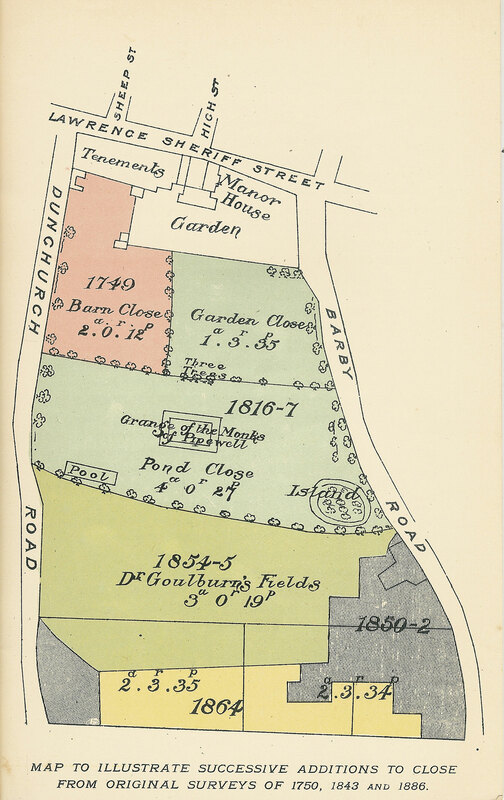 The report argues its case about the school having “from its foundation a wide open grass playground of ample dimensions” (MSAF271 & MSAF272) by listing the various additions to Rugby Close (the area in which Football was played) and publishing maps that highlight these. The school had moved from the middle of town with no playground to a Manor House with fields on the edge of town in 1750 (MBRN003). “An article in the Times newspaper, the leading journal of Europe, a few weeks past, on the Rugby School Football Rules and play, as contrasted with the Association Rules, has prompted me to write a few words on the game of football, as played at Rugby in my time, 1813–1820. The last time I played at Bigside in the Close was just 60 years ago, and my recollections of the game extend to 67 years… In 1813, the available space for the play-ground was not more than four acres at the most…The island was in a separate field from the Close, and the southern part of the present Close was divided into fields, and formed a small dairy farm. Cricket and Football at Bigside were played at the north-west corner of the Close, adjoining the Dunchurch Road. One of the goals was erected on the site of the Chapel, not then in existence. The report continues with Bloxam’s account of Football at Rugby School then breaks for its ‘open spaces’ conclusion before moving seamlessly into the Webb Ellis theory. 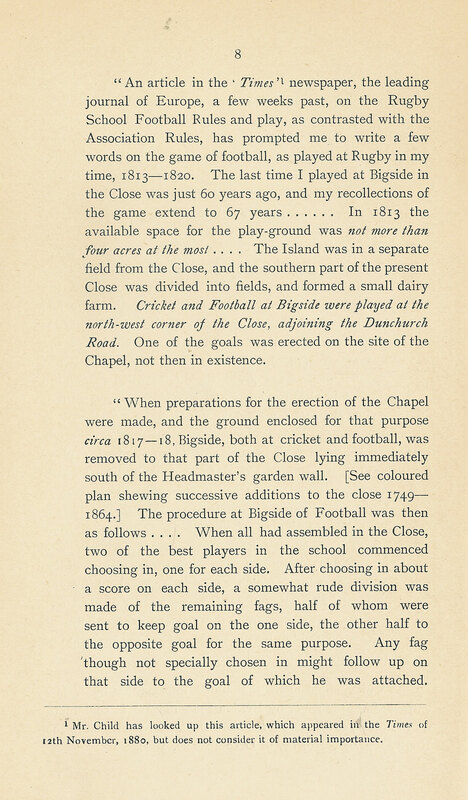 There we have it, in a nutshell and in one small paragraph, until 1749 there was no playground and the game was like Association football (soccer), according to Matthew Bloxam of course. But just in case we’ve missed something let’s check out how the report proves that Football at Rugby School was a kicking game and how William Webb Ellis invented the running game. DID THE REPORT PROVE THAT RUGBY WAS A KICKING GAME? “In the latter half of 1823, some 57 years ago, originated, though without premeditation, that change in one of the rules which more than any other has since distinguished the Rugby school game from the Association Rules. 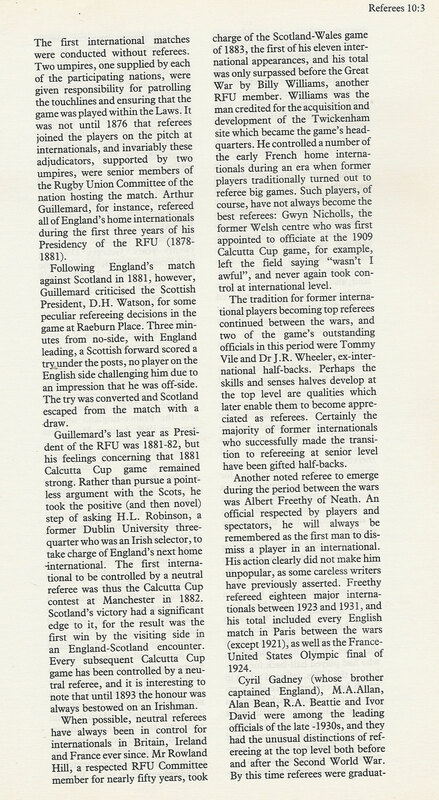 The next section in the report is dedicated to the correspondence of former pupils and it contains most interesting information in relation to the game, how it was played and the rules. One letter is from a former pupil, Thomas Harris, who was familiar with Webb Ellis and whose time at Rugby School overlapped Ellis’. The letter was written to Henry Homer who had contacted Harris on behalf of the ORS. “1. Picking up and running with the ball in hand was distinctly forbidden. If a player caught the ball on a rebound from the ground or from the stroke of a hand, he was allowed to take a few steps so as to give effect to a ‘Drop-kick,’ but no more: subject of course to interruption from the adverse players. I remember Mr. William Webb Ellis perfectly. He was an admirable cricketer, but was generally regarded as inclined to take unfair advantages at Football. I should not quote him in any way as an authority. 2. If the ball was caught in the hands from a kick, the catcher was entitled to ‘place try’ at goal, retiring a sufficient distance from the place where the catch was made. 3. All laying hands upon and holding a player was strictly forbidden under any circumstances. “I’m afraid that I can add but little to the recollections of Rugby Football which I gave in my letter to Homer. As to Mr. W. Webb Ellis and his practices, you must observe that I was several years his junior, and had not either reasons or opportunities for closely observing his manner of play. I am sure, however, that it was very generally regarded as unfair by the leading players of the day. It may be that his practice of running with the ball, which Mr. Matthew Bloxam speaks of as having been invented by him, was the point objected to; but of this I cannot speak from my own observation. Matthew Bloxam’s younger brother John Rouse Bloxam was still alive in 1876 and it is generally thought that as John was a contemporary of Webb Ellis, leaving Rugby School at around 1826 (to be confirmed), it is probable that Bloxam senior obtained the Webb Ellis information from him. WHAT WERE THE CONSEQUENCES OF THE REPORT? A year later, the Old Rugbeian Society, confident of no opposition, lay the plaque in the wall of the Headmaster’s Garden at Rugby School. It is this plaque more than anything that has perpetuated the William Webb Ellis event as being the origin of Rugby Union. So where do we go from here? Do we accept the report as having proven the origin of Rugby Union? Or shall we check out its conclusions to see if they are correct? I find that the best way to analyse something is to ask questions, so let’s start asking questions relating to this report to see if we can find the answers, and let’s keep asking questions until we are happy that we’ve found them. WHY DID IT TAKE EIGHT YEARS (UNTIL 1895) FOR THE REPORT TO BE COMMISSIONED? I believe that the reason for this is that the report was actually commissioned to discredit the chapter ‘Origin of the Game’ in the first ‘complete’ rugby history by the Reverend Frank Marshall, ‘Football – The Rugby Union game’, first published in 1892. In that book Marshall had leaned heavily on Shearman’s work for his references to the origin, but had come up with the conclusion that Rugby had evolved from the game the Romans had called harpastum. According to the front cover, it was a sub-committee of the Old Rugbeian Society. We have to turn to page 27 of the report to see who the members of this sub committee were. They were a group of four and before I tell you who they were, I’m going to give them a collective name. From now on, I’m going to call them ‘the plaque in the wall gang’. 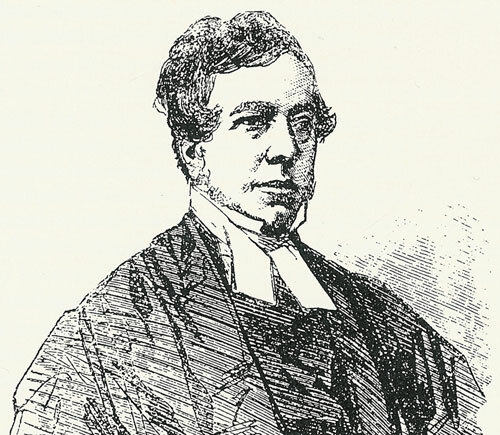 Henry Francis Wilson, son of the Rev. William Greive Wilson, Rugby, attended Rugby School 1873–1878. He was a barrister by profession and was called to the bar in 1888 before embarking on a career in the civil service, chiefly as a legal advisor in the Colonial Office. He was appointed Secretary of the Trinidad Judicial Enquiry Commission in 1892 and was Secretary of the Orange River Colony in South Africa from 1902 to 1907. Other posts included that of Secretary of the Royal Colonial Institute (1915–21). He was knighted in 1908. Herbert Henry Child was the second son of William Henry Child, Esq of Rugby. He attended Rugby School in 1870–1875 before moving on to Trinity College, Cambridge, where he obtained his B.A. in 1878. His profession was Barrister-at-Law, practising in Lincoln's Inn from 1882. Arthur George Guillemard was a former pupil of Rugby School, 1859–1864. Guillemard had played for England in the first international in 1871, was a founder member of the RFU and had served on its committee as a Senior and Junior Vice-President, as Hon Treasurer, Hon Secretary and President. He was the fifth President of the Rugby Football Union (the previous four presidents had all been schooled at Rugby). At the inaugural meeting, it was his proposal to name the newly formed society the ‘Rugby Football Union’. He refereed six internationals between 1877 and 1881 (JGPR103) and had acted as an umpire on the sidelines before referees were first appointed for matches in 1876. He was a solicitor. Harry Lushington Stephen was the third son of Mr. Justice James Fitzjames Stephen. He attended Rugby School from 1874 to 1877 and studied at Trinity College, Cambridge. He was knighted in 1908 and his profession was barrister-at-law (Inner Temple 1885). The plaque in the wall gang had of course all studied at Rugby School. 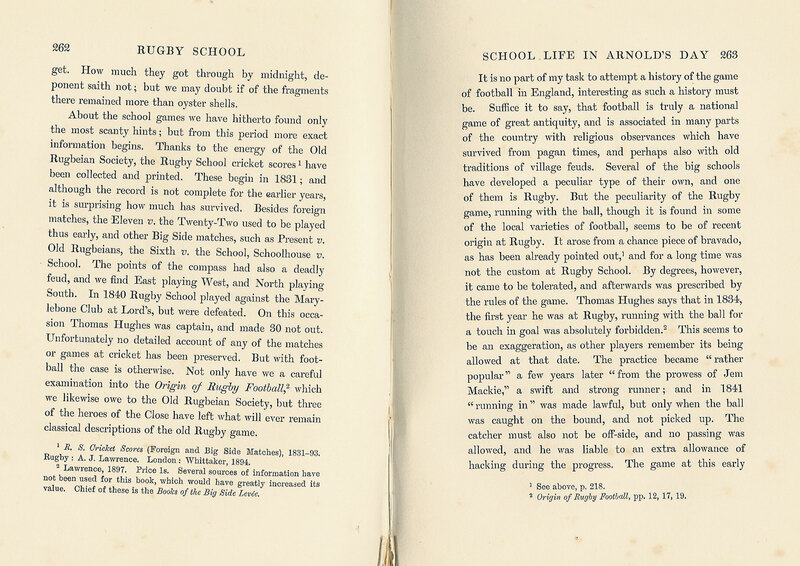 Guillemard knew the game inside out, but more importantly, the Old Rugbeian had put pen to paper in Marshall’s 1892 work in the second chapter ‘A Bigside at Rugby’, which included a large extract from Tom Brown’s Schooldays. He also wrote Chapter VII ‘The Foundation and Progress of the Rugby Football Union’. I believe that because the Rugby man was a contributing writer in that book, the sub committee of which he was a member couldn’t be seen to be attacking Marshall’s work. To have disputed Marshall’s origin theories in the report would have discredited the whole of the book, including Guillemard’s own chapters in which he sang the praises of Rugby School and the Rugby Football Union. 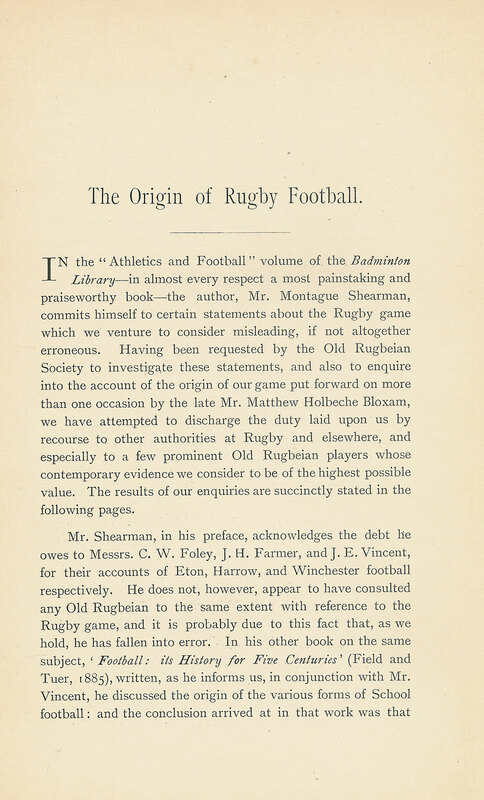 So the Old Rugbeian Society had no other option but to contest the origin theories in Shearman’s book instead, which is quoted as the main source of reference for Marshall’s initial chapter on the origin of rugby. Frank Marshall’s first edition was published in 1892. It’s possible that Arthur G Guillemard had a chat with Marshall and asked him to review his chapter on the origin. If he did, Marshall clearly didn’t listen because two years later, just a year before the report was commissioned, the revised and enlarged edition of Marshall’s book was published, with Chapter 1 remaining the same, errors included. 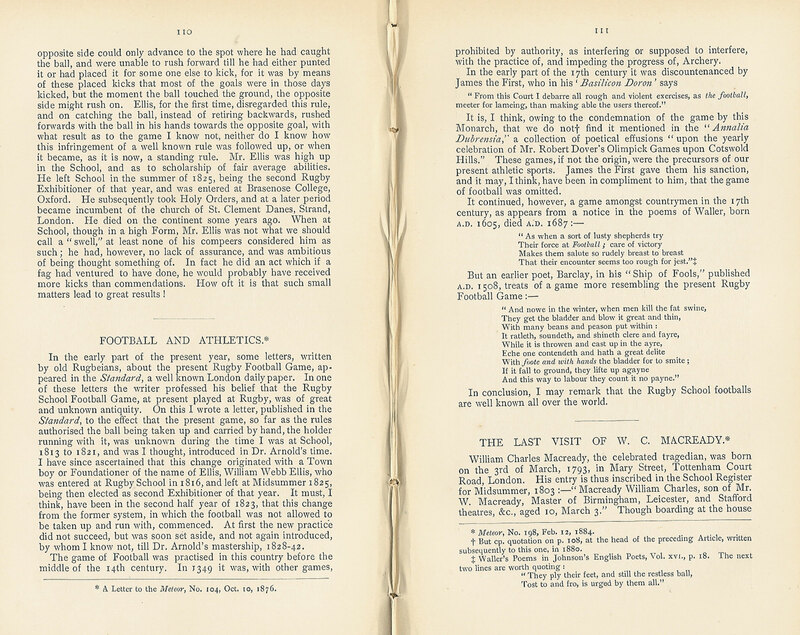 Also rubbing salt into the Rugby School wounds in 1894 was Montague Shearman, publishing the fourth edition of ‘Athletics and Football’. To me it makes more sense that this is the reason why the Old Rugbeian Society commissioned the report, to halt the ever increasing momentum of the folk football origin theory, and in particular Marshall’s theory that the game the Romans called harpastum was the origin of Rugby Football. We should now ask questions to see whether the information contained in the report is correct. Yes – the evidence is pretty conclusive. Until 1749 Rugby School was in the middle of the town and there was no dedicated playground for the boys. This information is readily available in sources relating to the history of Rugby School. Yes it did. 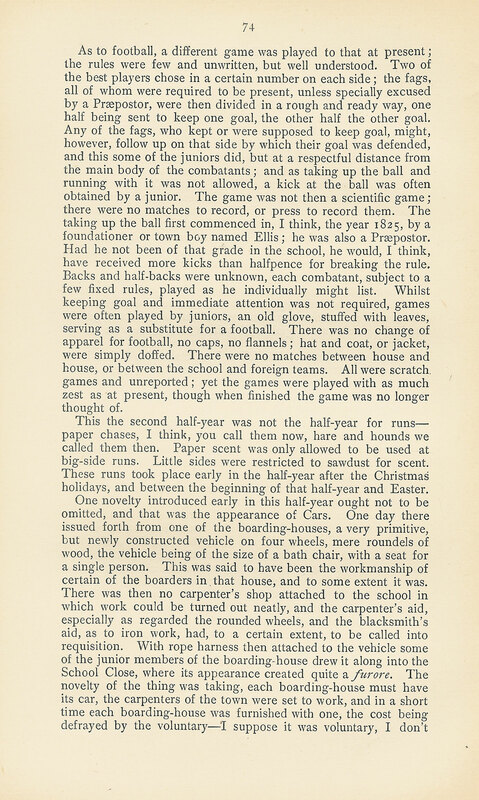 Matthew Bloxam’s 1880 article in the Meteor gives a good description of the nature of the game as played in his time at the school, 1813–1820. He states that those keeping goal were “watching their opportunity for a casual kick” (ORSR009), “It was Football, and not Handball, plenty of hacking” (ORSR009) and “until he had either punted it or placed it for some one else to kick, for it was by means of these placed kicks that most of the goals were in those days kicked” (ORSR010). Football at Rugby School was a kicking game, because it was illegal to pick a ball up off the floor, passing the ball was not allowed and running forward with the ball was taboo, so when the ball was on the floor there was no other choice than to kick it. If it was rolling forward towards you, maybe you could have stopped it with your hands then kicked or knocked it forward with your hands. But a kick would help the ball travel further and it was also a lot easier to do. Of course the most important factor – the objective of the game in Football at Rugby in 1813 was to score a goal by kicking the ball over the crossbar and between the posts. Football at Rugby School was a kicking game. DID WEBB ELLIS REALLY RUN WITH THE BALL? If what Webb Ellis did was so momentous, then it would have passed into Rugby School folklore and remained so. Yet, according to the report, pupils entering Rugby School less than five years after Ellis had left had never heard of him. If what Webb Ellis did was notable, a stirring event, either as a good or a bad thing, it would surely have been recorded in Rugby School folklore as the ‘Webb Ellis rule’, or something similar. The fact that it was not throws doubt onto the authenticity of the Webb Ellis event. IS THE WILLIAM WEBB ELLIS EVENT THE ORIGIN OF RUGBY UNION? Reyburn had the gist of it but then forgot about the origin and went on to write the rest of rugby history. Let’s look closely at two sets of words on the plaque. To the layman it would seem that as Reyburn suggests above, a game of soccer was interrupted and spoiled by the upstart Ellis. 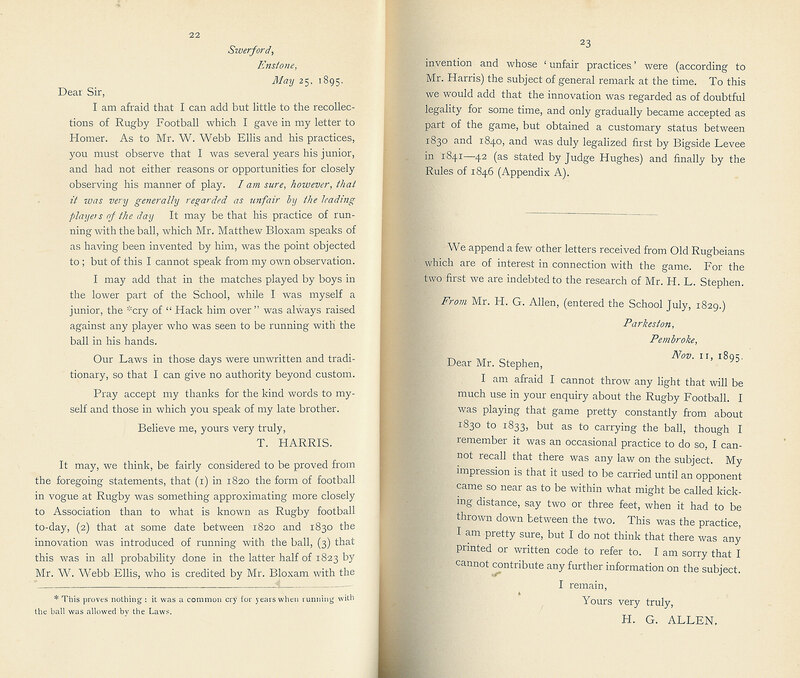 1845–1862 – Old Rugbeians start to take the Rugby Football rule book to universities, other schools and into towns and cities where they form football clubs that play under the Rugby School Rules. 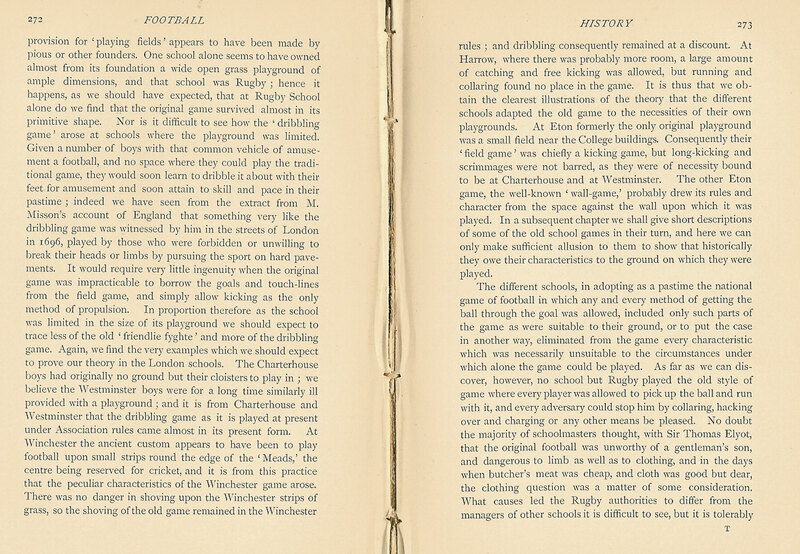 When the game was then played in locations other than at Rugby School, Rugby School became known as football as played under the Rugby School Rules, or its condensed version, Rugby School Rules, latterly known as Rugby Football. 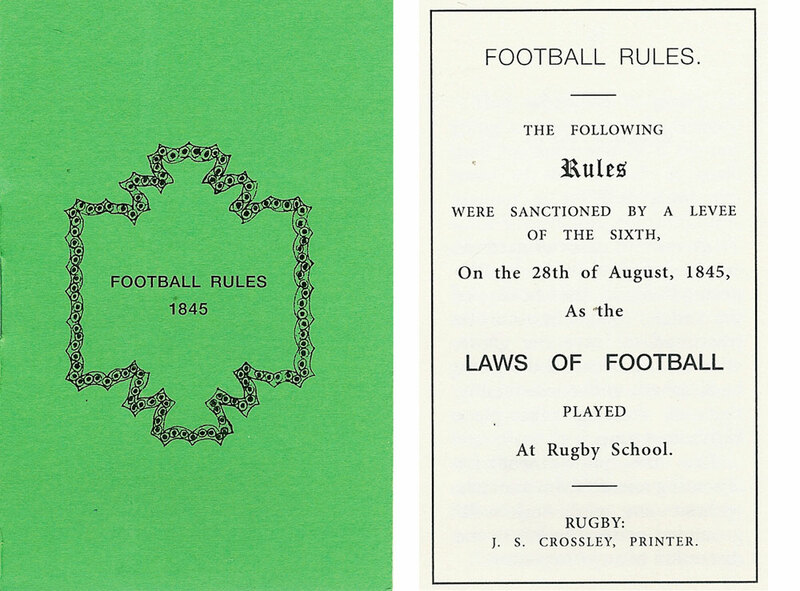 1862 – The Rugby Football Rule book is widely distributed to clubs, universities and schools that are playing the game. The pitch is given dimensions so that it can be played anywhere with a space large enough. 1871 – Teams playing Rugby School (Football) Rules form a governing body to oversee the clubs involved. The new governing body is called the Rugby Football Union and a new and different set of rules, (based on the Rugby Football Rules), are drawn up by a sub-committee of three Old Rugbeians (A. Rutter, E. C. Holmes and L. J. Maton). L.J. Maton is credited with writing the laws. The sport of Rugby Union is created. 1872 - William Webb Ellis dies aged 65, he is not to be credited with inventing the sport of Rugby Union for another 24 years. 1875 - Two different forms of rugby exist Rugby Football played at Rugby School and administered by the boys of Rugby School and Rugby Union administered by the Rugby Football Union. They are administered by different organisations, they have different rules and are played by different people therefore they must be different sports. 1876-1890 - With limited opposition to play under the Rugby Football rules, Rugby School slowly phases out the sport of Rugby Football and in 1890 Rugby School formerly join the Rugby Football Union. Rugby Football. The annual School v Old Rugbeians match is still played under Rugby Football rules until approximately 1900. As mentioned previously, the evolution of the games from that played at Rugby School to that played today is well documented, and as you can see from the above timeline, the same game was played by Matthew Bloxam in 1913, William Webb Ellis in 1823 and Arthur Guillemard in the 1860s. Guillemard and his friends created a new sport in 1871 which had a different set of rules and was eventually played by the likes of Wavell Wakefield, Jackie Kyle, Ian McGeechan, Willie John McBride and Richie McCaw. What’s thrown a spanner into the working mind of the 20th & 21st century human being, that’s you and I, is that the Association football game (soccer) that started in 1863 naturally assumed the term football, because it is played with the feet, and so we’ve grown up recognising football as being the round ball game. 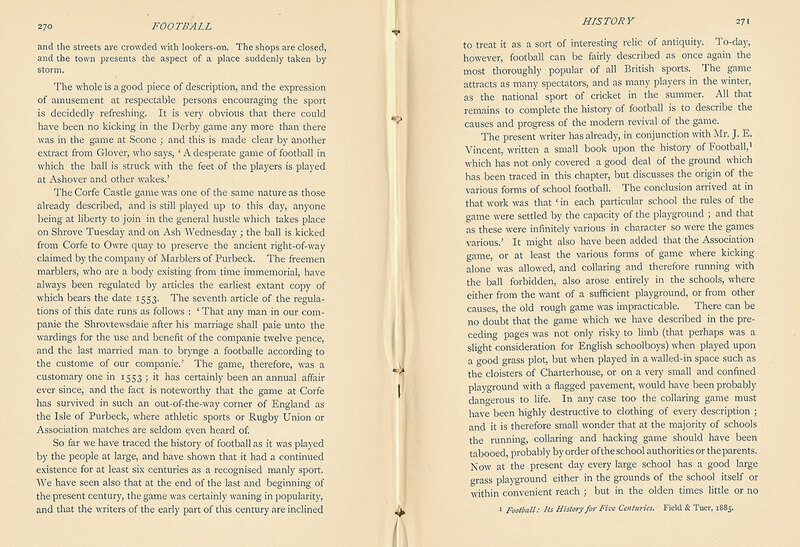 But if we cast our minds back to the first football history, George Routledge’s ‘A handbook of Football’ in 1867, we see that football was a very broad term, covering folk football, the school games (including Rugby School Football Rules) and Association football. WHY DO WE THINK THAT WEBB ELLIS WAS PLAYING ASSOCIATION FOOTBALL? So there are the three mentions of Association football and it must be noted that numbers 1 and 3 are meant to reflect what is said in number 2. WHY DO WE THINK THAT THE ORIGIN OF RUGBY UNION LIES WITH THE WEBB ELLIS EVENT? “Sir, - Permit an old Rugbeian, at school under the headmastership of Dr. Wooll, who resigned that office in the summer of 1828, to say a few words on the point in controversy in the present Rugby game. The running with the ball in one’s hands is of no great antiquity as regards Rugby, it has there originated within the last half – century. It was not so during Dr. Wooll’s mastership. When a boy had caught the ball in his hands he was not allowed to run forwards with it, but marking with the heel of his foot the spot where he had caught it, he was permitted without molestation to go back on his own side as far as he chose, the opposite side not being allowed to cross the point where the ball had been caught. He who had caught the ball might then either punt it, or place it on the ground and kick it, or allow some one else on his side to kick it so placed; but directly the ball touched the ground, the opposite side might rush forward and contend. Such was the rule of the game at Rugby School fifty years ago. MATTHEW HOLBECHE BLOXAM, at Rugby School from 1813 to 1821, and ever since a resident at Rugby. In this letter Matthew Bloxam says nothing about Webb Ellis. It was 53 years after William Webb Ellis had supposedly invented a game that nobody yet knew he had invented. Bloxam wrote the above letter in February 1876 and following that he wrote three major articles on Football at Rugby School (October 1876, December 1880 & November 1883). This is what he says in Meteor No 104 published on 10 October 1876. In the early part of the present year, some letters, written by old Rugbeians, about the present Rugby Football Game, appeared in the Standard, a well known London daily paper. In one of these letters the writer professed his belief that the Rugby School Football Game, at present played at Rugby, was of great and unknown antiquity. On this I wrote a letter, published in the Standard, to the effect that the present game, so far as the rules authorised the ball being taken up and carried by hand, the holder running with it, was unknown during the time I was at School, 1813 to 1821, and was I thought, introduced in Dr. Arnold’s time. I have since ascertained that this change originated with a Town boy or Foundationer of the name of Ellis, William Webb Ellis, who was entered at Rugby School in 1817, and left at Midsummer 1825, being then elected as second exhibitioner of that year. It must, I think, have been in the second half year of 1824, that this change from the former system, in which the football was not allowed to be taken up and run with, commenced. At first the new practice did not succeed, but was soon set aside, and not again introduced, by whom I know not, till Dr. Arnold’s mastership, 1828-42. The game of Football was practised in this country before the middle of the 14th century. In 1349 it was, with other games, prohibited by authority, as interfering or supposing to interfere, with the practice of, and impending the progress of Archery. It is, I think, owing the condemnation of the game by this Monarch, that we do not find it mentioned in the “Annalia Dubrentia,” a collection of poetical effusions “upon the yearly celebration of Mr. Robert Dover’s Olimpick Games upon “Cotswold Hills.” These games, if not the origin, were the precursors of our present athletic sports. James the First gave them his sanction, and it may, I think, have been in compliment to him, that the game of football was omitted. In his article Bloxam states that there were rules when he played football 1813–1821 and that one of the rules has since changed. Then he gives us conflicting opinions. In one sentence he says that he thinks that this is when running with the ball started, and in the next sentence he says that it started but didn’t succeed, and was then started again by an unknown person 5–19 years later. He then adds information about folk football but doesn’t provide a link from folk football to Rugby School, only a similarity between the ball described in a 1508 poem and the Rugby School balls that are known worldwide. At no point does he say that Webb Ellis invented football or rugby; he just thinks that Webb Ellis started the change in one of the rules. The important words in this paragraph are ‘originated’ and ‘change in one of the rules’, meaning that there is more than one rule, and that this is where the change in only one of those rules began. He does not say that this is the beginning of a new game. He does not say that Webb Ellis invented a game. He is saying that the game being played before and after the Webb Ellis event is the same game, but that one of the rules started to change. Ellis is playing an organized game with rules – Football at Rugby School (Rugby Football). 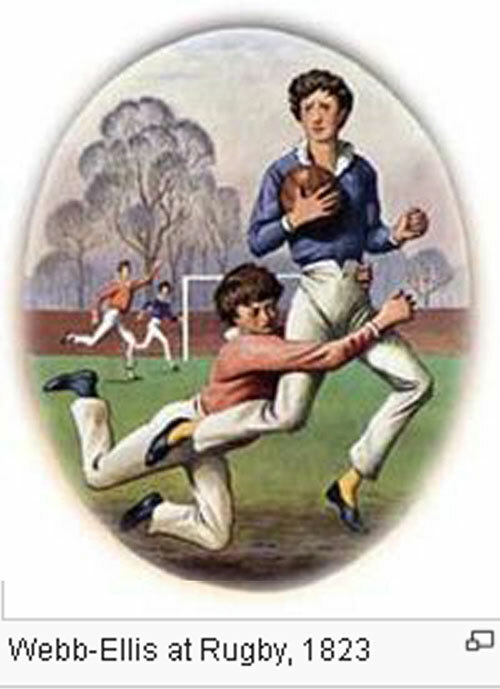 If he runs forward with ball, he is still playing Football at Rugby School, and the game remained as such until at least 1845 when the first rules were printed. Then, slowly as the game evolved and spread, it became football as played under Rugby School Rules or Rugby Football. Let’s look at the front cover and the title page of the first set of rules. Please note again on the front cover Football Rules 1845, the title page heading FOOTBALL RULES and The following Rules…… as the LAWS OF FOOTBALL. This is the same football that Mathew Holbeche Bloxam was playing in 1813, only the rules have evolved between 1813 and 1845 to include the action of running forward with the ball. In his mention of Ellis, this time he’s changed the date to 1825 and he still doesn’t say that Webb Ellis invented a game. Bloxam seems to be unsure, his facts are all over the place, and I believe that he is beginning to doubt his source for the Webb Ellis story. 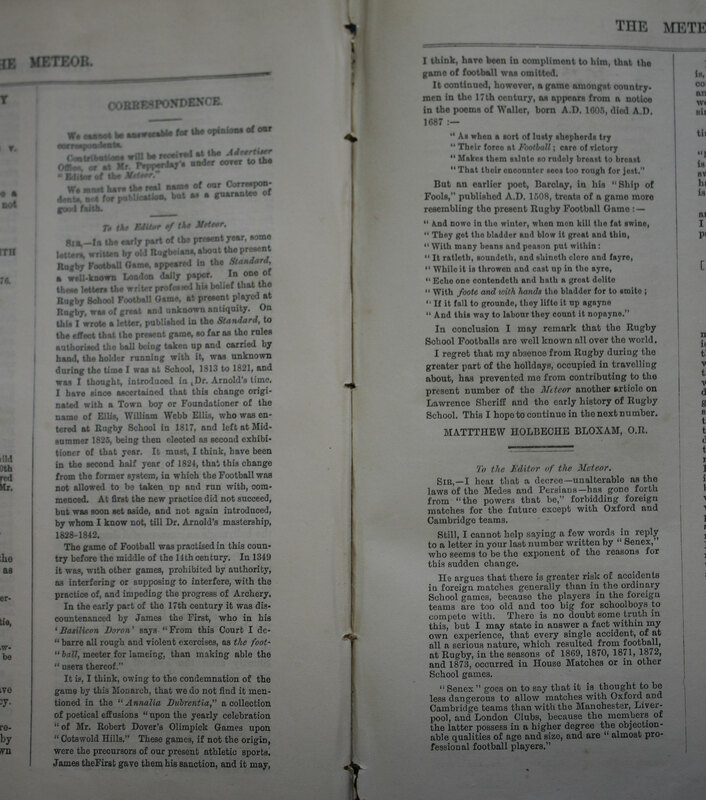 Summarising Bloxam’s three major articles that include the Webb Ellis event, he first says that it took place in 1824, then 1823, and finally 1825. He is unsure as to whether it ever happened, but even if it did he states that Webb Ellis only started the change in one of the rules. There is no sentence in which Bloxam states that Webb Ellis invented the game of Rugby Football or that this is where the origin of Rugby Football or Rugby Union lies. He does say that this is where the change in one of the rules originated, and this is his only reference to the word ‘origin’. 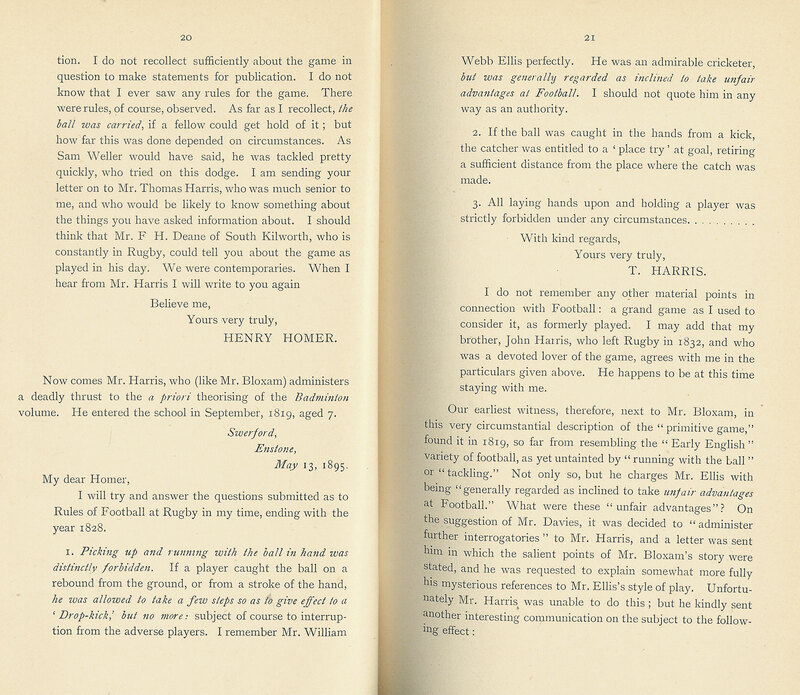 As far as Bloxam is concerned, Webb Ellis was playing the same football that he played, which was also the same football that was played under Thomas Arnold 1828–1842 when the rules that allowed running forward with the ball commenced. Did you see anywhere in Matthew Bloxam’s writings where he said that Webb Ellis had invented the game? I certainly didn’t. There’s a term for these types of statements – ‘misinformation’ – ‘false or inaccurate information, especially that which is deliberately intended to deceive’, as defined by the Oxford online dictionary. And deceive it still does, with the governing body of Rugby Union, World Rugby, still promoting the Webb Ellis event as being the origin of the sport. This illustration (from Wikipedia’s Rugby School page) continues to perpetuate the misinformation. Note the Association football goals in the background. It is impossible for these to have been at Rugby School in 1823 because that game was not created until 1863 and even then the first Association football goals did not have a crossbar. (a goal could be scored at any height). SUMMARY – It is impossible for William Webb Ellis to have invented a game that he was already playing. The game that he was playing when he broke one of the rules was 'Football' at Rugby School (Rugby Football). Matthew Bloxam did not say that Webb Ellis invented the game; he said that he merely started the change in one of the rules. If Webb Ellis did catch the ball and run forward with it for the first time then he contributed to the evolution of the sport – the changing of actions, aims and rules. He did not invent Rugby Union. The report of the sub-committee of the Old Rugbeian Society has been proven to be biased towards naming the Webb Ellis Event as the origin. The report had no other purpose than to name Rugby School as the origin of the sport of Rugby Union. It is an extremely unsafe publication and the facts contained therein cannot be considered authentic unless they can be backed up by other independent sources. CONCLUSION – It is impossible for the origin of Rugby Football or Rugby Union Football to be the William Webb Ellis Event in 1823, 1824 or 1825.